Proposed mechanisms underlying the differential effects of fructose and glucose consumption. Hepatic glucose metabolism is regulated by phosphofructokinase, which is inhibited by ATP and citrate when energy status is high, thus limiting hepatic uptake of dietary glucose and production of DNL substrates. 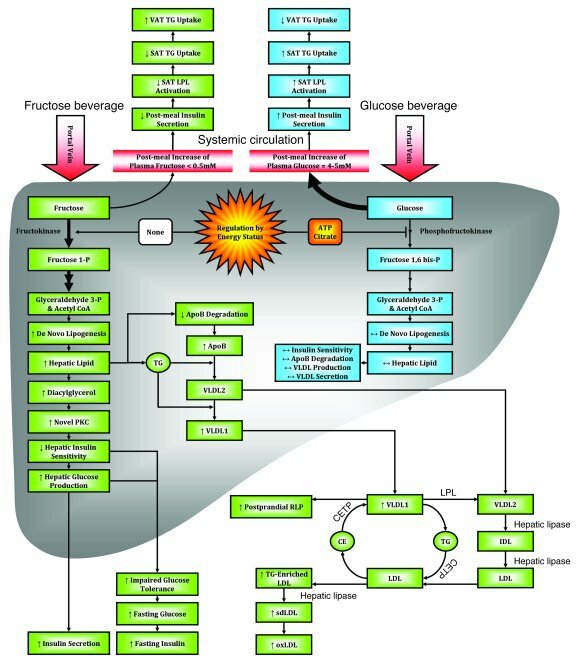 The hepatic metabolism of dietary fructose is independent of energy status, resulting in unregulated hepatic fructose uptake and increased lipogenesis. The resulting increased hepatic lipid decreases apoB degradation and increases production/secretion of VLDL-TG, mainly as TG-rich VLDL1 (29). This, along with chylomicron competition for LPL-mediated TG hydrolysis and reduced LPL activation by insulin, results in longer VLDL residence time, allowing for augmented cholesteryl ester transfer protein–mediated (CETP-mediated) lipid exchanges with LDL and increased LDL-TG and RLP levels. Hydrolysis of LDL-TG by hepatic lipase increases plasma sdLDL concentrations. After an overnight fast, DNL is no longer elevated and VLDL and chylomicrons remnants have been cleared; thus, plasma TG levels are normal. Postprandially, the increment of plasma apoB levels is associated with VLDL particles; in the fasting state, it is presumably associated with sdLDL, which turns over more slowly. As SAT is more sensitive to insulin activation of LPL activity than VAT, reduced postmeal insulin exposure may lead to less TG uptake in SAT and thus increased TG uptake/accumulation in VAT. Increased hepatic lipid supply may also induce hepatic insulin resistance, possibly through increased levels of diacylglycerol, which activates novel PKC (85). Novel PKC decreases tyrosine phosphorylation of the insulin receptor/insulin receptor substrate 1, resulting in increased hepatic glucose production, impaired glucose tolerance, and increased fasting glucose and insulin concentrations. oxLDL, oxidized LDL.